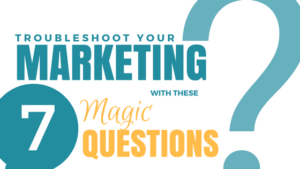 One of my new clients made a breakthrough discovery during our business coaching call recently that I thought would help you shortcut attracting more clients to your own business and troubleshoot your marketing. Dr. Nancy (not her real name) offers therapy and coaching services, but she was struggling to scale her business, especially since she doesn’t accept insurance. For the past 7 years Nancy had spent a total of $54,000 trying to learn everything from how to use social media to video marketing to PPC and more. By the time she got to me, she was pretty frustrated and confused why her marketing wasn’t getting the results she was expecting. I gave her a 7 question Marketing Assessment that I developed which took her all of 7 minutes to take. Immediately, the results of the assessment revealed the one thing that was getting in the way of more clients saying YES to working with her. Dr. Nancy was so excited to finally see the answers right in front of her! Because now she knew exactly what she needed to do to fix it. She could see why this ONE thing was completely derailing her marketing strategies from working effectively. The only regret Nancy shared was she wished someone shared these 7 magic questions (as she referred to it) with her 7 years ago. If you want to attract more clients take my Marketing Assessment right now. It’s a free. It will help you get clarity on what is your ONE thing that has been blocking your marketing success.